3 days prior to the arrival date. There are two things we are proud of here at Step Inn. First, is our excellent location. We are situated in the well-known Golden Triangle of Kuala Lumpur, where everything is easily within walking distance. 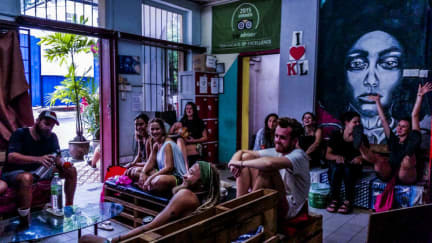 In this area is the busy China Town(10 mins), street food heaven Jalan Alor(10 mins), the best bar street in town Changkat(10 mins), shopping central Bukit Bintang(15 minutes), and the famous Petronas Towers(30 mins). We are also a few minute walk to the local metro(LRT), airport shuttle(Star Shuttle), and one of the central bus terminals(Pudu Sentral), so you can easily plan your next destination. The second thing we pride ourselves in, is our hospitality. We do our best to establish, a warm homey environment. The moment you walk in the door, you are considered part of the family. We provide a free map and enjoy giving tips on the city, so you can fill your few days or maybe many days, with lots of things to do. Our knowledgeable staff can also give suggestions for your continuing journey out of Malaysia’s capital city. For being a budget guest house we do provide a couple perks that you won’t find in many places located in the Golden Triangle. 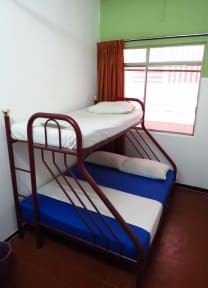 We have many types of rooms available, double-ensuite, double, single, family, and dormitory beds. All rooms are clean, with a window and fan, except our ensuite, which comes with A/C. On check in we provide you with a fresh towel(all rooms) & free roll of toilet paper(for single, double, en-suite, & family rooms only). In the morning, there is a free simple breakfast, with all day coffee and tea, that will help you get started so you can begin your tour of this great city. We provide 24 hour reception, same-day laundry service, and free WiFi in all the rooms, so you can stay connected at all times or get help at any hour. So, if you are looking for a homey budget guest house, with an excellent location, great knowledgeable staff, and nice facilities, please Step Inn. It's good enough for how much you pay for. Good location to access to major sightseeing points. cheap and good for a night or two.